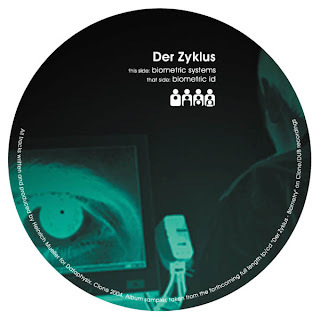 Der Zyklus' Biometry came out on the Clone offshoot DUB label in 2004. This release is the first outing for Heinrich Mueller under that name since 2000 and the first for an album. Like the previous Dopplereffekt album, Linear Accelerator, it certainly doesn't sound like the previous releases under this name either. I will also revert to using Heinrich Mueller for this article as this is indeed the name credited here (not that he has ever used the name Gerald Donald on any of his releases). When this album first came out I was impatient to hear it and bought it when I first saw it on vinyl, perhaps the CD version came out a while later as sometimes happens. While it is a very attractive artefact on double white vinyl it has always been an album I have seldom had the time to put into listening to all four sides but I‘ll just say I would recommend having it on CD for this reason. When I started this process of going through all the Heinrich Mueller releases in order I knew that from Linear Accelerator onwards I would really be pushed to describe them musically and conceptually. I feel like I succeeded with LA but it took me almost 7000 words to get there. Considering it seemed such an impenetrable piece of work, particularly on the music front, to find the thread of a concept within it and how the music fitted together was a pleasant surprise. On the surface here the concept is fairly straight forward, we are even lucky enough to have a single interview done to promote it with the Polish writer Pawel Gzyl which I will quote from extensively. On the musical side however we are still in deep waters. The synergy I spoke about last time which he has developed between the music and concept is still evident here and is developing. The music is nowhere near as challenging as some of the longer tracks on LA but the tracks are still not exactly easy listening either. Not that he would want it to be accessible, the whole point, to me, appears that we have to make an effort with this music, to listen more closely, to live with it for a lifetime if necessary (it's not tied to fashion) and even question what constitutes music. In answer to this he has stated, "There are rhythms throughout this work, everyone has a different perspective of what rhythm is. Percussion is not the only source of rhythm, waveforms are also rhythms. Patterns that repeat themselves is rhythm. No certain sound or percussive element is exclusively a rhythm, every element produces its own rhythm." He also said on this subject, “There is no single method for music development everything is considered. Whatever instigates the musical idea will be considered its stimulant. There is no formula or restrictions on methodology. Musical creation should always be free of constraints." Just to get all of this commentary out in the open for your consideration at the beginning he also finally said, “...the environment is the fundamental inspiration for a musical work and this embraces everything, sound, science, social structure etcetera. Inspiration has no boundaries." It's very exciting when you think about music afresh in this way and realise it is still wide open to expand in so many different directions. It is only human beings that put restrictions and definitions onto it which only serve to limit this evolution. Wikipedia tells us that ‘Biostatistics (biological statistics) or biometry is the application of statistics to a wide range of topics in biology. It has particular applications to medicine and to agriculture. But this term has now been largely usurped by the information technology industry.’ It is this latter usurped definition which Mueller is obviously concerned with. This is all about real time personal identification by a computer data base. Either by iris scanning, facial recognition, hand geometry, fingerprint correlation etc. The German company, Byometric, is cited with a website address in the artwork and there you will find the following text on their home page. 'Every human being is unique. So is his iris. We have learned to read the iris and made it into an ID. Tamper-proof and impossible to lose. You should also check out their promo video found there as well and once you get past the ‘for your convenience and keeping you safe’ crap you start to see how this technology has the potential to control your life for good or ill. What if you choose to opt out of the data base, how would this affect your multiple access? When speaking previously with John Osselaer, Mueller was asked if he had any concerns about the control of people through technology. He said, “Well the concerns are that we will eventually loose our liberty because tracking and data chips will eventually sooner or later be installed in all unborn generations via world governments. I will refer these yet to be born as the GPS-generation for they will be tracked anywhere on the planet by our big brothers via satellite.” I might have thought this quote slightly paranoid previously but take a look at this site and maybe its not so far away. I’ve also included here some of the, frankly laughable, images they have on this site. The other ‘datalink’ found in the artwork is for another of these companies, IBG, ‘one of the biometric industry's leading consulting and technology services firm. 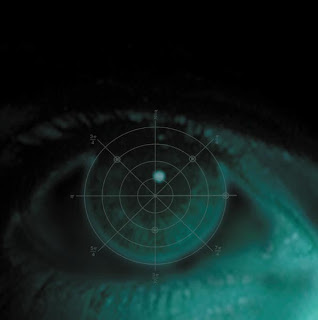 Since 1996, IBG has provided technology-neutral, vendor-independent biometrics services, strategy, and solutions to government agencies, systems integrators, high-technology firms, and financial services organizations. 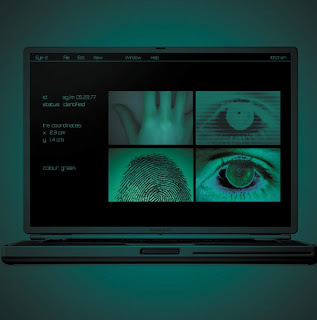 IBG leverages real-world, hands-on experience with multiple biometrics - including fingerprint, face, and iris systems - to design, integrate, and deploy custom ID systems, access control, IT security, smart card, and transportation solutions.' Again, if your interested to do some research yourself the link to both these sites are at the end of article. If you do go to their site you’ll soon find them proudly proclaiming a contract with Homeland Security (scarily this might just be our futures). Some of you might be wondering what my problem is with this stuff, certainly representatives of those companies would. 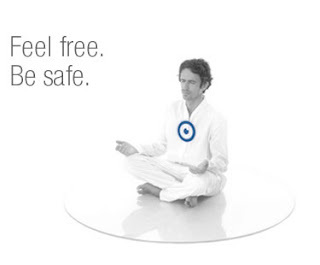 I firmly believe I should not have to rely on technology to make me feel safe and certainly not free. Of course I already trust technology not to reveal my passwords, bank details etc but I just feel that also trusting these types of companies as well is a step too far. As I will show later, Mueller himself will expand on just this point. While there is nothing wrong with the actual technology itself, it is rather the end motives of the people that control it that are suspect in my opinion (or how the collected data might be used in the future). Even though I might not have listened to the album as consistently as others, I did keep coming back to it, the puzzle of it kept drawing me in. I did know it had a few good tracks but remembering which ones they were and having to keep changing records to find them didn’t always seen worth it. To understand a little more about the synergy thing he has going on Mueller himself explained the music and its relation to the science of biometry thus, “The Biometric theme required a different technical perspective and the science of biometry stimulated the musical electronics. The music reflects concept of biometry." This album does take some measure of concentration no matter the format, which is a compliment really, but the listener won't always have the time. At least LA is on CD only and that made it a lot easier to make the commitment necessary to get into it. Anyway, some people might be of the opinion, especially if they haven't heard it, that this album sounds a lot like LA but on closer comparison there is very little which is sonically similar. It does certainly have the same synergy between concept and music but the music is quite distinct, a different sonic palette is being used. The opener is suitably enough 'Biometery' which is very like a soundtrack, think 2001: A Space Odyssey. Which is such a lazy comparison I know but it actually would fit there very well. While on this subject I see that the music here is published by Universal Music. I actually did some research into this and on their website and it mysteriously doesn't list any Der Zyklus or Heinrich Mueller projects but presuming there are now people trying to place some of his music into a wider context it would appear that on a surface level a science fiction theme might suit him best. However, a director with a truly penetrating vision would I hope see its potential for a far broader interpretation. ‘Biometry’ does indeed set the tone very well for the rest of the album but in some ways almost any of these tracks could have done that job just as well. Perhaps significantly or not lower case is used for all text including the track titles. ‘Polar Coordinates’ starts off promisingly enough with a lovely repeating melody, soon joined by a more ominous texture, but it just as soon morphs into one of the more challenging tracks of the album. By the end of its almost 4 minutes it shows no signs of its original form. Again it could be from a soundtrack. It is obvious that Mueller is continuing to create new musical forms and I and anyone else that tries to put them into an already existing genre are wasting our time. This is music of the future or outside of time altogether, which has yet to be defined into a definitive genre or even find a use as of yet. penetrate the iris of my eye for the purpose of biometric identification. ‘Facial Vectors’ is one of the more ‘challenging’ tracks to be found here. It appears to be of simple enough construction but doesn’t really go anywhere. It‘s nice, but more of a feeling than a complete thought, which does of course give it its place in the context of an album. ‘Hand Geometry’ comes as a real shock at this stage mid point of the album, with the opening sounds literally jarring you to attention. It does contain an element from Linear Accelerator towards the end to my ears. It sounds almost like the disintegration of a track with a suitably sudden ending. ‘Recognition Time’ is rather harsh sounding as well, another track which has been brutalised, although in this case atomised seems the right term. It changes, not once but twice into another track altogether with completely new sets of sounds. Something which Mueller has been increasingly doing up to today since LA. The third and final part of the track has for me the most to recommend it. Very micro, without the House. Interestingly on the record these last three tracks all occupy the same side (C) and they do seem to fit together in their own disjointed fashion. Some insight to his approach to these tracks in particular can be gleamed from this quote, “Electronic music is based on science and the scientific method is utilized in its creation. Theories and hypothesis are put forth and if they are practical and plausible they will be tested to verify them. Some theories work and some don't, but no theory is considered too abstract. All is considered. The more radical the better.” This is pretty radical sounding alright! ‘Iris/Retinal Scanning’ has a very difficult beat which forces your body and mind to conform to new steps. Predictably I think it’s worth the effort with some lovely atmospheric textures emerging after awhile even though the difficult beat doesn’t let up. ‘Optical Fingerprint Correlation’ is yet another track which takes on a different form within its time frame. The latter section however is amazing all on its own. It’s very reverby with a wide variety of sounds but is over all too quickly in my opinion. ‘4000 Irises (2000) Persons Max)’ has a nagging rhythm which oddly sticks in your head. Some disturbing sound frequencies move in and out of the mix of which everyone will have their own interpretation but mine is disembodied dead digital souls! It is a scary way to bring the album to a close. Maybe, if he’s saying anything at all with this final track, is that not all is not well with this technology. A bit of minutiae to deal with next. Alden Tyrell is credited for his masterful mastering services. I mention it only as I think it’s the first time this information has been noted. Alden is a well respected Dutch producer and DJ himself with releases on Clone and Viewluxx to his credit. Also in the sleeve notes we find that the project was ‘developed 2003/2004‘. On the subject of timeframes he has said, “There was no time frame in which work had to be completed, when the concept is comprehensive then it is considered complete. Time tables are not a part of our working ethos." Also the 12" which came out to promote the album was quite bare in the additional artwork department and simply reproduces two of the tracks found here and like a sucker I bought it a month or so before the album came out! The album artwork is really well done, some of the images are credited with coming courtesy of one of the companies already mentioned. On the record label the printing is very dark and most of the detail is lost. On the CD however you can see the full images and they are very effective. 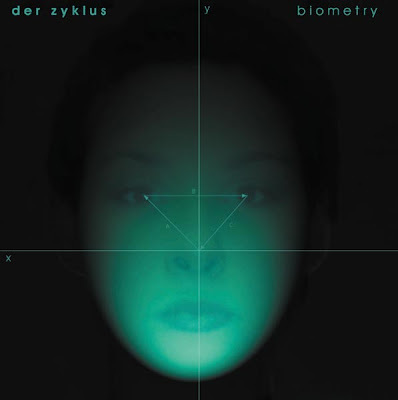 The cover itself is really good, a green lighted head shot of a female going presumably through her facial recognition test. Lines marked X and Y separating the 4 quadrants of her face and lines A, B and C measuring distance between her irises and the tip of her nose. It is a very ghostly image it has to be said. She looks to me like To Nhan Le Thi from Gesamtkunswerk era Dopplereffekt and more recently from live appearances as Der Zyklus and Dopplereffekt. The other picture with a person where we only see the back of a males head and part of his face is not Mueller but some guy from Biometrics archive. It is a negative image, touched up with more green, as is the text, and it looks similar to promo stuff the company currently have on their site so maybe as I said it’s one of the pictures they got from them and was adapted to fit the artwork. The other two images probably do come from the company. The one with the eye close-up has a design superimposed with mathematical symbols surrounding it which look pretty cool. All of the timings for each tracks are given in seconds which ties in very well with the precise nature of the subject. For sure with this album he is continuing to mine a very productive interface between science/technology and music (finding the perfect muse for himself). He said of this source of inspiration in relation to creating art, “To a certain extend you could say this. It takes skill and improvisation to unlock the hidden secrets of the natural world. Science has a beauty all its own. Science and art always interface to create something new and innovative. Take electronic music for instance, this is the perfect example of the science and art interface. The term art has many connotations.” As I said, this is the third release attributed to Der Zyklus, after a fairly substantial four year gap from the previous 12” on Gigolo. Not that timeframes as we know have ever been a major concern of Muellers. Speaking to Pawel Gzyl he said of this album, “This is the latest theme within this conceptual template.” So in the mind of Heinrich Mueller there is definitely a common conceptual template between all the Der Zyklus releases to date. I would personally plumb for this theme to be simply the progress of science/technology. Der Zyklus means the circle/cycle and perhaps in this context it could mean the cycle of life which really brings us back to evolution but then most things ultimately do. I just mean Mans evolving knowledge of science and technology. I think that Mueller is conscious of the fact that we should remember that as we progress in matters of the head, technically and scientifically, we should be mindful of regressing in the sphere of the heart, emotionally and spiritually. He said on this subject, “Science and technology are not perilous at all, its the people that control it that are dangerous. Atomic energy does not threaten our very existence it’s the powers that be and other subversive elements that make it threatening. We are our own worst enemy, not science and technology. People always finger-point inventions when their masters should be the ones that are singled out. Machines don't make decisions (at least not now) human beings do.” But this is of course a cycle itself which is leading us we know not where. Biometry is viewed by its proponents as a means to a utopia of safeness and perversely, freedom. Again we will all have our own opinions on this but where is this particular evolutionary cycle of science and technology leading us? I feel sure that Heinrich Mueller is asking a very subtle variation on this same question. I’ve also said this before that Mueller is playing a dangerous game by not explaining his motives more widely. By seemingly on the surface flirting with Nazi imagery in the past and now glorifying the tools of control he appears on the surface, which is about as far as most people will delve, to actually be to some degree condoning these things as they currently exist. While he is to some degree glorifying the technology he is also making a statement about the uses it is put to. You only have to read his own words for this to be soon self-evident and I hope I have succeeded in showing this. It is hard therefore to understand why he only spoke with one obscure Polish webmag on this subject. He may have faith that someone like me and others will pick up on it but while my own readership is wider than I ever thought possible it would soon be dwarfed if he started speaking more widely to print magazines and the like. He obviously has a strong opinion and while he’s under no obligation to express it far and wide if he does ever choose to go down that road it would spark more debate on this subject than his music has to date. But who’s to say, his more subtle approach might pay off in the longer term, it will just take a long time to get his point across to people. Drexciya obviously understood that the revelation of the Storm Series was more powerful if you discovered it for yourself, also leaving it open to be interpreted in different ways, but this particular point of Mueller’s is much more specific and could be expanded upon without ruining any of the mystery. There is also another theme or pattern continued with this album also. Which is the referencing of a specific commercial or otherwise company as part subject matter. 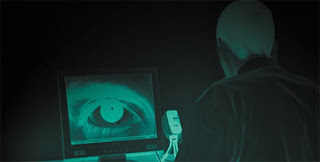 Namely; mobile communications (NTT DoCoMo), high energy physics (DESY) and now biometry (Biometric Group). There has also been a descending order of how to the fore these companies are featured as well with the latter reduced to just some images and datalinks. But it is a new element that is present that was not before. This introduction of a real world element to music which is usually a medium of escapism is interesting, but not original. It may reveal how Mueller would like to have his music viewed, not as frivolous but important (about the future). In that it's about real things, a kind of commentary on how we are evolving. Maybe it means nothing more than what it is, on the surface, but it does make it somehow more legitimate. But that is the great thing about art, we will all find different things within it. This final Mueller quote about science sums up pretty well why this subject is so close to his heart and why he is still pursuing it to this day, “Well science is a body of knowledge that mankind has accumulated over the ages about the natural world, the greater universe. We use this knowledge to gain command over nature for the progress and benefit of the human race. Science is imperative for our survival and progress, so I would not say its fascinating but more essential.” His next essential release will needless to say be my next port of call. Another of the rare Drexciya interviews has found its way to me. Big thanks to June for locating and scanning it. This is the 9th full length James Stinson interview I have archived here to date and to my knowledge there were only ever 10. That of course leaves us with just one more left to locate! This would be the one from 1994 which was done by Tim Barr. It was probably only available in a print magazine, as was the Groovesmag one, so if you ever come across it let me know and we'll figure out how to get it up here. I have already included some quotes from the 1994 interview in 'Drexciya Speaks', the article which rounds up all of the James Stinson quotes under different headings, but they were gleamed from the later 1997 Tim Barr interview where he referenced them. I will slot these new quotes into 'Drexciya Speaks' asap as well. Check it out at link below. I must say that this interview is particularly interesting and revealing. Sure to become another important piece of the Drexciyan puzzle. Enjoy. 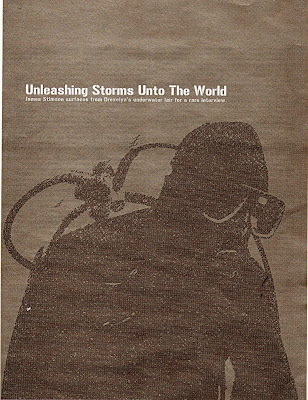 James Stinson surfaces from Drexciya's underwater lair for a rare interview. In this electronica era, where genres mutate and multiply faster than you can say drill’n’bass ghettotech, Drexciya plays like singular transmissions from a parallel universe. It is an essential otherness coded into the very genetics of its music, a slowly percolating wash of sound that systematically subverts electro’s 808-driven pulse by driving its icy, clipped rhythms deep into liquid layers of low frequencies. And, more obviously, this otherness is dictated by Drexciya’s stubborn and insistent refusal to play any of the minutiae of the publicity game, instead shunning interviews, avoiding press, and shrouding its personal identities in veils of mystery that have driven the electro crowd into gossip overload. This emphasis on following the moment informs all aspects of Drexciya – even apparently, the overwhelmingly complex mythology that underlies its releases, which pits Drexciyans, "the water breathing, aquatically mutated desendants" of "pregnant America-bound slaves" discarded on cross-Atlantic voyages "by the thousands during labour for being sick and disruptive cargo," against the dreaded Audiovidual Programmers. "Man, that was spontaneous!" Stinson says, laughing. "It was back in '88, and we'd just been fooling around with music for a few years. One day, I woke up and it just came to me! I rolled straight out of bed and it all just started flowing. I didn't have the name at first, but the stories started coming naturally, and one day the name 'Drexciya' came to me, it just felt right when I pronounced it. Since then, we've done some heavy meditations on it, and the story has just evolved. But the music always comes first - the concepts always follow the music. We listen to the tracks and decide how they correspond to these principles and to these stories, and then we build the album around it. If a track doesn't fit in the flow, we'll just put it aside. We're perfectionists, and we control the output of our music. If it's not working, we don't force it: We just wait until you're clicking on all four cylinders, and the energy is strong and clear, and that's when music comes out fast and good." Of course, Drexciya isn't about to give up all it's secrets, and Stinson turns shadowy when I ask him about what principles are driving Drexciya now, admitting cagily that, "There are some principles we have that we can't share with the world." When pressed, Stinson reveals a little of what Drexciya has in store. "At the moment we're working on unleashing the seven storms onto the world, which are seven albums that Drexciya is involved with that we're releasing into the world under a whole host of names, from a whole host of countries," he says "It started with the first storm, which was the new Drexciya release. Then the second storm was Transllusion, which came out of Germany, then you had The Other People Place LP coming out of England. And now we've got four more storms in the works, coming from places like Portugal. They're just in a holding pattern, just waiting to be unleashed." Check out latest online issue of Groovesmag here.